This PowerShell script will give you a report of all of your Office 365 mailbox users who haven’t logged in for any given number of days. Once you’ve saved the script to a .ps1 file on your workstation or server, you can run it with just the script name or you can include the number of days inactive as a command-line option. the command-line option is especially handy for a scheduled task if you want the report emailed automatically every week, day, or whatever. …where “90” is the number of days inactive. You will need to modify the $Outputpath variable to whatever is appropriate for your environment. # Purpose    :    Creates a new resource mailbox. #                 threshold, the user will be prompted for one. #                 it, whether for free or profit. # Accept command line input of a number of days for an inactivity threshold. # If no threshold was entered, prompt for it. # credentials and connect it. # ***** Modify this path to whatever is appropriate for your environment. # limit and store in this variable. # Get the mailbox statistics for the selected mailboxes. # given threshold or with no last logon. 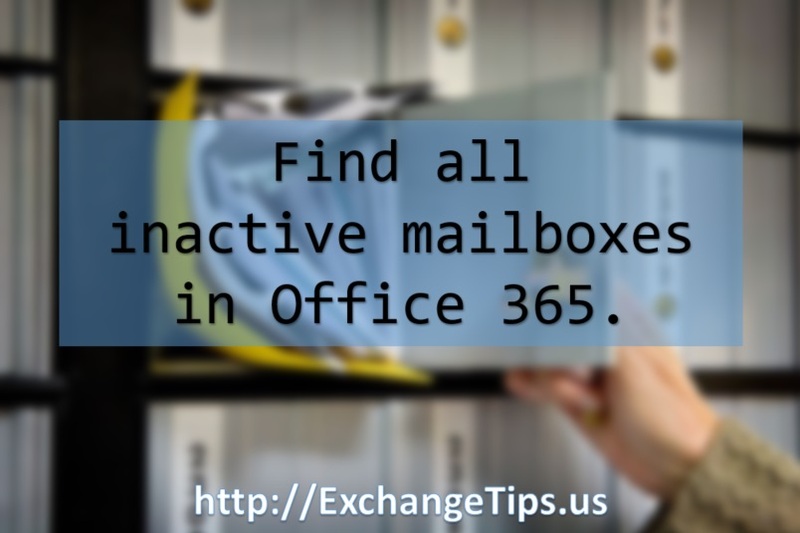 # Add a line to the output for each inactive mailbox. # equal to the mailbox age. # Save the resulting data to the file specified in $Outpath. You can then use this information to track down the inactive users to see whether or not they should still have accounts. Thanks but I get the following error. A CSV is created but doesn’t seem to contain enough users. The below GUI tool gives you inactive users on all Office 365 services and also you can find the inactive users by their last activity type such as last mail read time, last mail sent time, last team message sent, last yammer post time etc. Following are the some of the inactive Office 365 user reports which are available in the above tool.